Benno's Figures Forum • HäT Crowdfunding Touchdown! Perhaps you could spare me a Landwehr figure for FIGZ? I could swap - I've got some Strelets Brits/Scots left. Zed1 wrote: I could swap - I've got some Strelets Brits/Scots left. My Zulus and Prussian arrived today. The sculpting of all three sets is quite well. And I am absolutly surprised how heavy are the figures and its plastics. Never had before a plastic set with a weight comparable to tin, but it doesn´t seems me so fragile how I am expected it after reading Mabos writings. It´ s certainly better than the former very soft plastic. I see only some problems to combine these new figures with the older Haet Zulus which were more slimmer and had also smaller heads. The unmarried zulus should have been much slimmer than the adults. The opposite seems the case with Prussian Line Infantry and new Landwehr. It´s a pity that the producer doesn´t orientate their sculpting of new productions on the older ones. 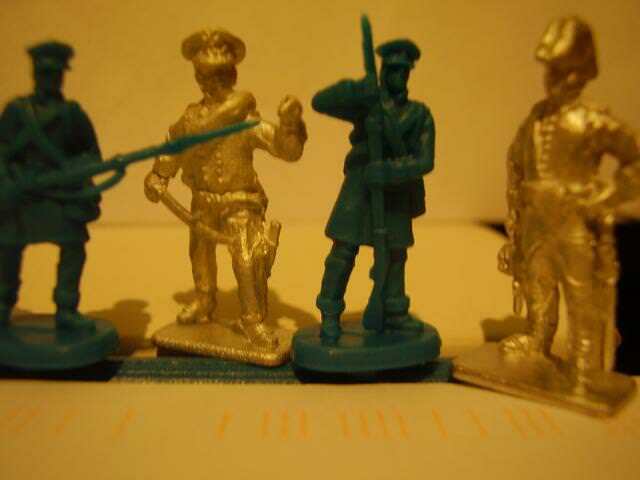 It isn´t a problem that the Landwehr figures are smaller, but theirs bodies are much slimmer too. It should been easy to allievate coherent figures and sculpture lines. I agree totally with you. Your examples are also my painful favourites. You can´t combine these Line and Light Infantries although they belong to the same period. Nearly the whole 1805/06 range of Haet had such strange switchs of sculpting and sizes. Fortunatly the differencies of the recent Heat figures aren´t so big. Theirs combinations will been strange, but not impossible. Haets huns and late romans are more a problem or a mission impossible. Mine haven't arrived yet. And damn it! I was hoping for the opposite. My sets have arrived, I don't have the previous HaT Zulus so I can't compare but looking at these ones by themselves I really like the figures and quite a bit more than i expected to. The poses are good and can be made better. The plastic is good, I think limbs will be able to be repositioned easily with hot water. The plastic cuts easily and cleanly without furring and mould lines are easily trimmed. The Landwehr are, I think, a good match in size for HaT's Prussian infantry. both are the same hieght if you disregard the hats and the landwehr are perhaps a few microns slimmer but I won't notice it when they're in different battalions. Everything about these figs is just as good as I expected. And my compliments to Massimo for the wonderful bonus figures, I knew they were good but up close they look even better. Metal Prussian extras, but noticeably bigger (taller) than the landwehr. Very disappointed. If they had been general and ADC as originally discussed, it would not be so noticeable, but the extras are "officers" for teh units, so mixing them in will be difficult. I may remove the bases to see if that helps. Totally agree with Marc here. I was thinking of pledging for the British light and heavy dragoons, but will not do so now. The Landwehr are excellent figures, but, as Marc stated, the bonus figures are too big and not only are the figures cheaper at retail, but the retailers got them before many of the crowdfunders. Not a happy state of affairs. Wait - they are on Ebay for approximately the same price as they would have cost for the the crowdfunders who only have the benefit of a few extra figures while they all would have purchased the sets as well if they would have been produced in the regular way? So that's all? It's all about getting a 100% insurance for not having to pre-finance the masters and forms, right? That's the idea of crowdfunding, I think. And I like the bonus figures and I am happy to have them in my collection. MABO: the main problem is that they took our money to finance the project and then delivered to retailers first. The figures were on general sale before many crowdfunders had been supplied. The problem is not really one of price, but of business ethics and common courtesy. If a manufacturer takes your money for a crowdfunding project, you should be the first to get the product. Quite simple, really. And, yes, the bonus figures are very good when viewed in isolation. When compared to the sets they are meant to complement, they are useless, as they are totally out of scale. The problem with delivery of the sets is that all of the figures, those for the crowd funders and those for general distribution would have arrived at the various distribution points at the same time on the same ship. doing it any other way would be ruinously expensive. I expected to recieve my sets before they went on general sale but i realise now that was an unreasonable expectation. Still I do think each distribution centre could be given a priority list of crowd funder orders to be dispatched first. Someone on the HaT site e-mailed HaT with this gripe and they said they would address the issue in future, And I have recieved my crowd funded figures before any of the Australin dealers I looked at has them listed. The other thing that occured to me is that some of the dealers may have put money up front in a wholesale crowd funder, it's possible. The Zulu bonus figures are a good match for the Zulu figures, but you are right the prussian test figures are huge ( I think they might be more in scale with the sizing test figures before they were scaled down to better match the Prussian infantry). The ADC and surgeon might be alright as stand alone figures and maybe the sapper, a kind of Prussian version of a Le Gross style giant with an axe. the company officers are more difficult (unless I buy the Italeri Prussian infantry set in which case they might fit right in), i'll have to see what they look like when painted. If they don't work with the regular troops then I'll have to start thinking of them as a 'bonus', i.e. something nice that I wouldn't normally get because I don't normally buy larger scale metal figures. And they are very nicely sculpted figures that will make a fine display. The 400 other figures in the box are absolutely fabulous and if you gentlemen hadn't signed up for the crowd funder I might not have them. Graeme wrote: The 400 other figures in the box are absolutely fabulous and if you gentlemen hadn't signed up for the crowd funder I might not have them. That is important and I do not care if I get my sets an few days later than retailers. They came to my home, I get the bonus figures and that is what I paid for. And like Graeme said: I am one of the guys who made this set possible. MABO wrote: That is important and I do not care if I get my sets an few days later than retailers. They came to my home, I get the bonus figures and that is what I paid for. And like Graeme said: I am one of the guys who made this set possible. Well - that's exactly the point of what I wanted to say: if I haven't overseen anything, there is no such thing as a bonus figure for the light dragoon set. So in fact - what exactly is the benefit of crowdfunding it when retailers may sell the set for a cheaper price later on? I find the concept somewhat confusing. Well guys you all got what you paid for, which were the bonus figures. So Hat has lived up to its commitment within this emotive marketing ploy. Biding today is at £29.99 on a half box of painted Hat Unmarried Zulus. I suspect the Seller placed that first biding price. is this merely Speed Painting? And you may also thank me for getting the UM Zulus & Prussian Landwehr. We "Kickstarters" put our money where our mouths are. As you can see the bonus figs are somewhat larger but I think even my dodgy photography can't hide what nice looking figures they are. 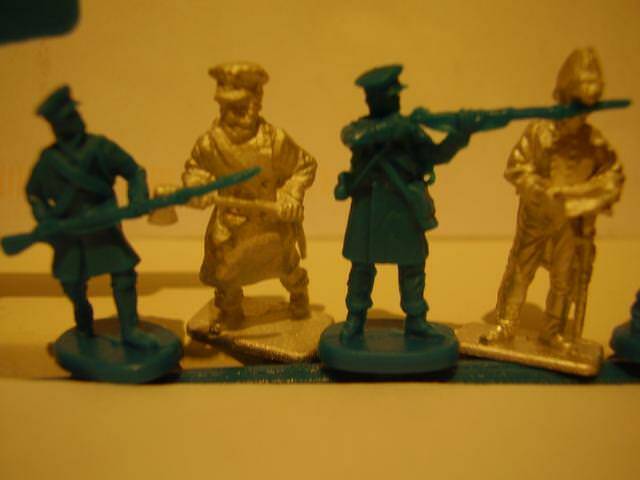 The regular figs are a near perfect match for the Prussian infantry. Looking at your post above, if I bought these from Drum&Flag at todays exchange rate I'd be paying the same price I payed in the crowdfunder. Havn't seen what price the Aus. dealers will list them at yet but perhaps I might even make a saving. I think this set will be a good seller and if the crowdfunder had failed they might just have been produced in the normal way at some time. But when? After the Austrians and Russians? After the ACW and AWI sets? I've got them in my hands now, I'm happy with that. Zed1 wrote: So in fact - what exactly is the benefit of crowdfunding it when retailers may sell the set for a cheaper price later on? I find the concept somewhat confusing. In the case of the Peninsular Dragoons the benefit might be getting the sets made. These sets have already been produced but a mistake at the factory meant they were too large and they were sold as 28mm. Some of us begged HaT to remake them in 1/72 and suggested that crowdfunding them would take care of the additional production costs. If the crowdfunder fails and the sets are cancelled I do wonder if HaT will ever pay a second lot of up front costs to make these sets a second time. In general terms the crowdfunding is simple enough. HaT has a backlog of sets people are waiting for. If they use just normal production they can make X number of sets this year. If they use normal production plus a second line of production which is crowdfunded they can make X+C number of sets. Of course, if they want to review the way this works I won't complain if I get the sets quicker and cheaper. And yes, thank you Donald and the other kickstarters for helping to get these made. And thank you Graeme (& the other kickstarters): it was a team effort. I'm sorry not all the kickstarters are happy but that's their prerogative. 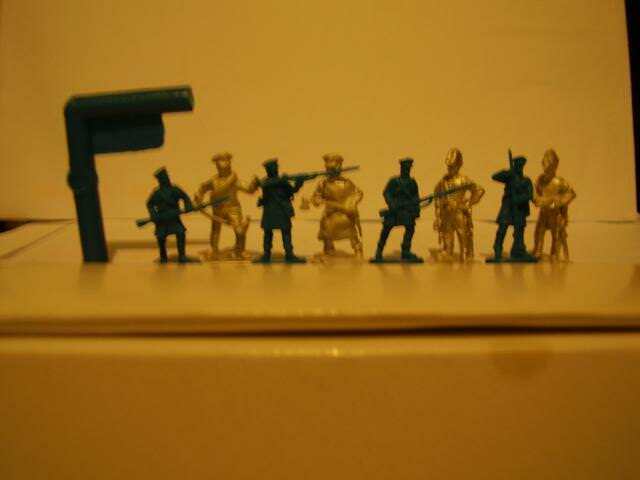 I don't think I could include the metal figures in the same units as the plastic but I have various metal (eg SHQ)Landwehr units, where the figures are much the same size, I can place them in.